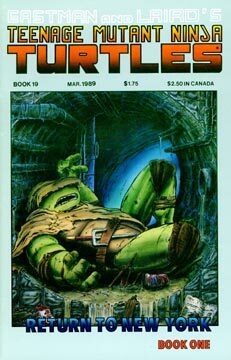 The issue opens with a double page spread of Raphael lying unconscious in the sewer. The camera zooms in on a New York Times newspaper that’s lying on the ground, and we see that it’s dated December 23. The image of the Times fades into an image of The Gazette, dated December 19, where we see Raph, Mike and Don holed up in the barn in Northampton, Massachusetts. Raph is angry and shouts, “I can’t stand it anymore!” The unhappy Turtle is tired of hiding in Massachusetts and blames Leonardo for all their troubles. Raph states that Leo is afraid to go back to New York and settle their feud with the Shredder and the Foot. As Raph is arguing with Mike and Don, Leo comes in, and he’s none too happy about Raph’s complaints. Leonardo tells Raph that they will go back to New York, “I’ll say when… and then, we go as a team.” As Leo makes his case, he lays his wood practice katana on Raph’s shoulder… not a wise choice. A fight erupts between the two brothers. Leo manages to get the upperhand and pins Raph to the ground, but Raphael graps the wooden blade and frees himself from Leonardo’s grasp. Raph then picks up Leo and throws him through a wall. As Leo lies stunned, Mike tries to stop Raph. “Don’t even think about it, Mike! See ya around!” Raphael snarls as he storms out. We then cut back to the sewers of New York City, where we see a squad of Foot on patrol. Shredder’s minions are approaching the spot where Raph was lying at the start of this issue. However, as the soldiers pass, we discover that Raphael was merely sleeping and he’s managed to avoid being spotted. Raph is itching for a fight, so he attacks the Shredder’s minions and a long battle takes place. Raphael is victorious, even though he was greatly outnumbered. As the lone ninja investigates another tunnel, he finds something totally unexpected.